Obituary for Beatrice Eileen (Gooch) Bush | McCoy-Moore Funeral Home Inc.
Beatrice Eileen Bush, 92, Bidwell (Porter Community), Ohio passed away Tuesday, October 16, 2018 at Arbors of Gallipolis, Ohio. 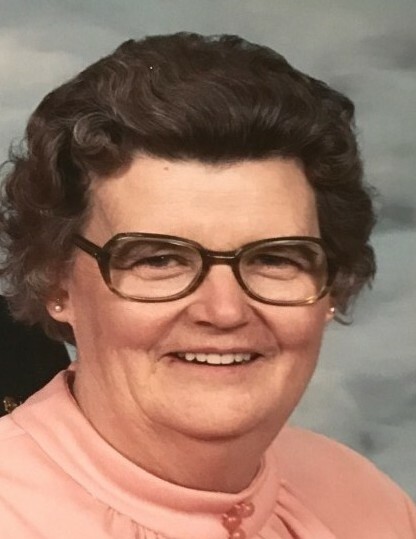 She was a retired sales agent for Logan Monument Company at the Vinton Display and a member of Vinton American Legion Auxiliary 161, Vinton OES Chapter 375 and the Vinton Garden Club. She attended Trinity United Methodist Church, Porter, Ohio and Harrisburg Baptist Church. Beatrice was born December 28, 1925 at Rio Grande, Ohio, daughter of the late Wilbur and Lola (Phillips) Gooch. She was preceded in death by her husband, James Olan Bush, October 16, 1993. She is survived by one son, James Allen (Kimberly) Bush, Porter, Ohio; four grandchildren: Robin Sayre, Bradenton, Florida; David Ashton (Molly) Kennedy, Bidwell, Ohio; Jill (Nick) Hopkins, Gallipolis, Ohio and Roger (April) Bush, Syracuse, Ohio; great-grandchildren: Tanner, Tricia and Tiffany Sayre; Johnny (Chelsie) Holsinger; Rowan Holsinger; Avery King; Munro Bush; Rylee and Roman Hopkins and great-great-grandson, Shay Holsinger. In addition to her husband, she was preceded in death by daughters Judy Smith Kennedy and Barbara Ann Bush; sons-in-law, Ozie Smith and David Kennedy; brother, Maurice Gooch and sister, Alma McMillin. Funeral services will be conducted 1:00 PM Friday, October 19, 2018 in the McCoy-Moore Funeral Home, Vinton Chapel, with Pastor Robert Powell officiating. Burial will follow in the Vinton Memorial Park. Friends and family may call at the funeral home Friday 11:00 AM - 1:00 PM.